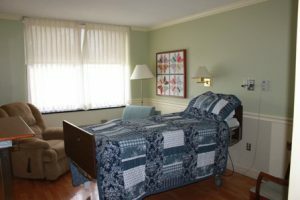 and routine hospice care (private pay option) in situations when home hospice care is not possible or optimal. Talk to a hospice expert at our state-of-the-art Mount Holly hospice center. 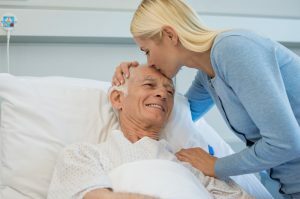 Although hospice care is usually provided where you live, there are times when symptoms such as severe pain or nausea require an advanced level of care that is better provided during a short stay in an inpatient hospice facility. If your loved one’s needs intensify, the Samaritan hospice team may recommend a short-term transfer to the Mount Holly Center. 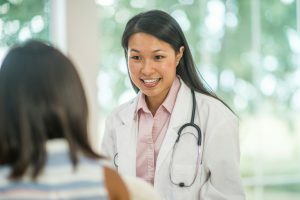 A hospital liaison may also recommend a transfer to one of Samaritan’s two hospice centers if you or your loved one is admitted to a hospital with severe pain or symptoms from serious illness. 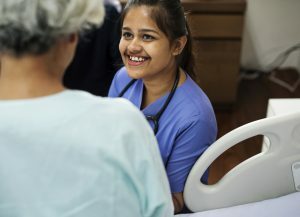 Our care at the Center includes the comprehensive hospice services we provide in people’s homes (trained hospice team, medications, equipment) but also allows your loved one to receive round-the-clock professional supervision to ensure proper administration of medications and treatments. 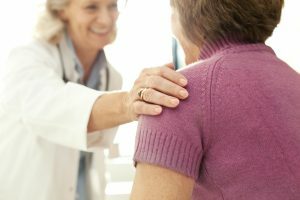 The goal of this inpatient hospice care service is to control severe pain and symptoms so that your loved one can return home to family and familiar surroundings, if possible, and resume hospice care at home. 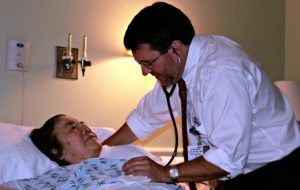 Who is Eligible for Hospice Care in Mount Holly? We encourage you to speak directly with our nurses regarding hospice eligibility in Burlington County, NJ. Call us 24/7 at (855) 337-1916. Hospice care is a benefit of Medicare, Medicaid, and the Veterans Administration. Most commercial insurance plans also cover hospice with applicable co-pays and deductibles. Samaritan staff will assist patients and families in understanding and securing eligible coverage and care options. Click here to learn more about who pays for hospice care. Need a break from care giving? Respite care services offer a planned, short-term break for family caregivers from the challenges of caring for a loved one with an advanced illness. There are times when you or your loved one cannot stay in your home, or are unable to return to home after a hospital or inpatient stay. This can happen for an assortment of reasons including the unavailability of a care giver or transportation would be too taxing.